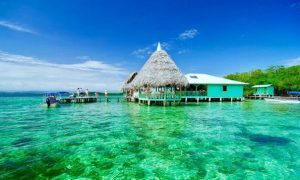 Bocas del Toro, represents an archipelago in the Caribean of Panamá, being a very popular zone, a destiny wich lets you relax in the middle of beautiful beaches, of tropical jungle, wich was describe by the Lonely Planet as a fantasy for the biologist. So, Bocas del Toro, is part of tan archipelago of islands with blue waters, with beaches of white sands wich are duly surrounded by palms and tropical jungle. In it´s great majority the hotels are located in Bocas Town in Colon´s Island wich represents a caribean town very fun and a relaxing zone with an amazing variety of bars and restaurants. Other way, in the speak, most of the people speak in English. Likewise, Bocas del Toro, is a perfect place for couples whom are looking for a romantic refugio and for those families that wants to have fun and experimentar in an relaxing and fun enviroment. Highlighting, that between main activities of this touristic site are the tours on botes to the nearest islands to relax in the adyacents beaches, snorkel, diving, see dolphins, walks for the jungle, exploration of the bats caves, and visit the indigenous cultures. The spends of the acommodations are from $15 even $30 per night. To Bocas del Toro, you can get there traveling to the principal town of Bocas in the Colon´s Island, taking one of the diary departing flights from the Panamá city, and from San José in Costa Rica. Likewise, also you can take a bus or car from the Panamá City or from David to the Almirant, a town duly in coast where you can take a bote to Colon Island in Bocas del Toro. Also, in Almirant are various safe places where you can leave the cars. From the other way, to this it can get by the vía Bocas Town, wich represents a small town where you can walk and get to any place. The acommodations in Bocas del Toro can be various depending of the needs of each tourits. This can be from economics acommodations ecologics hotels, for the entusiasts of the nature, romantics scapes for the couples and fun hotels for families. So, the majority of the hotels are located in Bocas Town, in the principal Colon´s Island. In fact, there are some hotels with see view, but there aren´t beaches in Bocas Town, so, Playa Tortuga Resort, is located just next to Bocas Town, it counts with a private beach. Equally, is the nearest island of Bastimentos y Carinero, wich count with various hotels, to wich you can get there in botes. Finally, Punta Caracol and Al Natural, offers to the travelers an whole intimate experience and relaxing with nature and romantic aislated from the place. 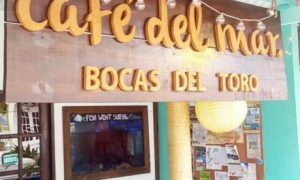 The gastronomy in Bocas del Toro, is variety and with accesibles prices to all whom get there, en su mayoria the most serve plates in the popular restaurants are the fish, Thai food and Lemon Grass and Fussion and in ‘‘Buena Vista’’ for the Mexican and American food. It also is the Chinese and Indian food. So, also in this you can find fast food, like a Super Gourmet Deli at the end of the main street that offers a complete menu that goes from sandwiches and much more. Last one, on the sea food menu counts with a beautiful landscape, exist the Coral Cay restaurant, wich you get there in bote, and is located geographically over the sea, offers in its menu´the frehsiest lobsters that you can pick from the tank and enjoy of the beautiful view to the sea. 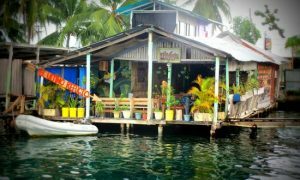 The tours in botes: One of the best and favorites ways to meet Bocas del Toro, is taking a tour at day light on a bote, to go to the dolphins bay to whatch them. Beaches like Red Frog and the Zapatilla Keys, the mangrove swamp full of life, the launches in the Coral Cay over the sea and the best sites for snorkeling. The Red Frog Beach : This one represents one of the most beautiful beaches of Panamá, wich you can enjoy of beautiful and worms white sands, big waves, tourquoise surrounded by the natural jungle. Get there is too easy, taking the boat by the Express of Red Frog in the main street, in there you can also find a restaurant in the same Red Frog beach, wich offers good burguers and chairs for rent. In Red Frog the current is very strong wich is recommended be cautious to swim. The Beach of Zapatilla Keys: Between the best places to practice snorkel are the Coral Key and the Punta Hospital. On the other way, diving, you can find some operators of PADI in main street, to practice diving you can see some reef well conserve of the world, it can see stingrays ,locust and different kinds of crabs and all variety of tropical fishes. Rides on Bikes: In Bocas del Toro, you can ride bikes wich is very cheap and fun. Surfing : One of the many atractions of Bocas del Toro, is surfing, because has one of the best beaches in Panamá to surfing, with different kind of waves, including big waves for the experts on surfing. The best season for surfing in the caribean are in December and March. La Finca Los Monos: This one represents a private tropical garden located 10 min from Bocas Town, and you can take a tour for 2 hours, to enjoy watching the variety of trees and plants. The tour of Río’ or The Tour of an Indigenous Village: One of the most beautiful natural landscape are the rivers, this include a view to an indigenous village of Ngobe Buglé´, an indigenous culture that has a lifestyle, wich has changed a little bit since Cristobel Colón visit this islands. The Tours of the Nature: Another one of the atractive touristics of Bocas del Toro are the beautiful views of mangrove swamp and jungles, wich surround all the coast. It also can make a tour to the Pájaros Island, whose have exclusives birds of the island and another one with a bats cave in Bastiments Island. 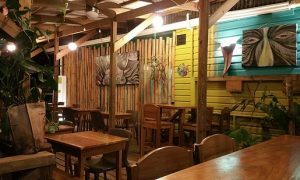 Outdoor food: Diners out side are another one atractive touristic in Bocas del Toro, in there exist an whole variety of food, including the main plate from seafood, Indians, Italians, americans, and much more at local prices. Night life: In Bocas del Toro the life night, used to be very fun, exists different places for all kind with excelent enviroment to feel relaxing, through this meet other people and have a nice time, there are Buena Vista Deli & Bar, located in front oh the water, being an atractive place for its relaxing enviroment and good food. specials made by young bartenders. Finally is the new La Iguana is right in front of the water and the famous Barco Hundido, it represents a good place to get distracted and dance. The Handicrafts: In Bocas del Toro are a variety quantity of handicrafts stores and ceramics in the main street, it counts with foreing sellers of all the world. In there are selling the famous moles from the kunas, one of the best places to buy it in Panamá.